The 2017-2018 school year is starting earlier this year for all of Clark County, including the four public schools in town, and district officials are urging parents to make sure their kids are ready. 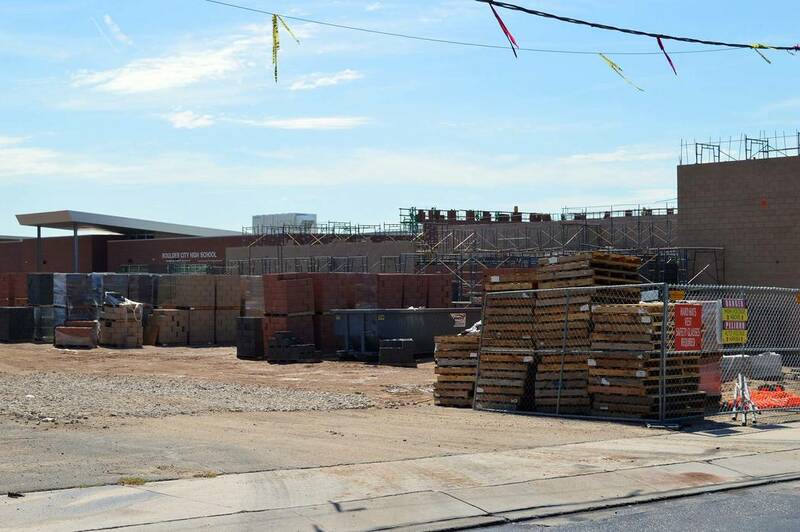 Celia Shortt Goodyear/Boulder City Review Work on the new theater at Boulder City High School will continue through the school year, which starts Monday, Aug. 14. The first day of school is Monday, Aug. 14, rather than at the end of the month, as it has been in the past. According the school district, the earlier start date will allow students to finish their exams before the winter break, rather than after. Despite the earlier start, all of the schools in Boulder City are ready to go, and administrators are encouraging parents and students to be ready, too, starting with registration. All students in the district — current and new — need to register for school before it starts. Parents of currently enrolled students can register with the Parent Portal via Infinite Campus at campusportal.ccsd.net. It will take them approximately five minutes to register, as their information is already in the system. Parents of new students can start the registration process at register.ccsd.net. If needed, parents use computers at schools within the district to register their children. Once they are registered, Mitchell Elementary School principal Benjamin Day encourages parents and students to focus on goals. Gelsone also believes getting kids back on a schedule will help with the transition for the start of school. Parents also think getting their kids back on a schedule is a good idea. Gelsone encourages parents to make sure their children’s vaccinations are current and that they look at the suggested school supply list on their school’s website. Starting earlier isn’t all fun and games, as it has brought one specific challenge. “The biggest challenge is to make sure that all of our families were aware of the change of start date, so that they did not plan vacations during this time,” said Boulder City High School Principal Amy Wagner. One thing that remains the same with the 2017-2018 school year, however, is what each principal hopes the year holds. Day said he hopes his students — the youngest ones in the district — will start learning how to be leaders. Wagner said she hopes her students will spend the year building relationships with those around them.